Nestled in the highlands, a five hour bus ride climbing the sole Northerly bound road emanating from the Laotian capital of Vientiane, lies the small town of Vang Vieng. The unbelievably beautiful backdrop of mountainous jungle is in seeming stark contrast to its famous party atmosphere, a cheap place for backpackers to drink themselves into oblivion, before swinging Tarzan like on a rope over a fast flowing river, or willingly plummeting nearly twenty feet off the Death Slide into, at times, the rather shallow waiting waters below. Reflexes and common sense dulled by liquor, a few extra souls are harvested here yearly by the Grim Reaper, saying nothing of the everyday injuries that range from mere scrapes to broken bones or worse. The accidents are no secret, and tales are commonly discussed among adventurers, an awkward pause between downing shots of homemade Laotian whiskey. It’s party at your own risk. 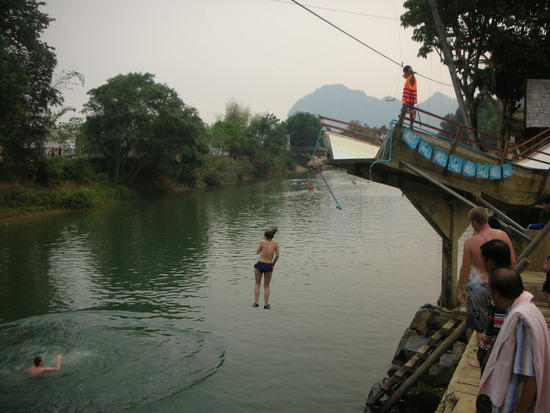 The rope swings, the zip-lines, mud volleyball ring, Death Slide, and the other attractions of this riverside backpacker amusement park are built with the sole purpose of enticing the relatively affluent traveler into purchasing a few dollars worth of the identical liquor served in each establishment. After tiring of one bar, you hop into river, sprawled out on an inner-tube, floating downstream with the current, and a bar employee from overhead heaves a lightly weighted water bottle tied to a rope in your direction. Grab a hold of it and they'll reel you in. Fishing for backpackers- pays more than any other catch on the river. I don’t drink a drop of alcohol, but still enjoy myself, watching everyone else play their drinking games, spray painting their bodies, diving in the mud like pigs, and exchanging travel stories. If people want to drink and take part in risky behaviors that’s their right, so long as they don’t endanger others. As I tube down the river, I pass the last bar, ignoring the fishing lure thrown to me, and head towards “open water.” With the spectacular scenery around me, and the quiet solitude of nature whispering in my ear, I feel immense peace. The water swirls, a bird flies by, the sun warms body. I see the Grim Reaper in his black hood standing on the riverbank. I smile and wave hello, Death smiles back. Vang Vieng- like any other moment, there is no place I would rather be.